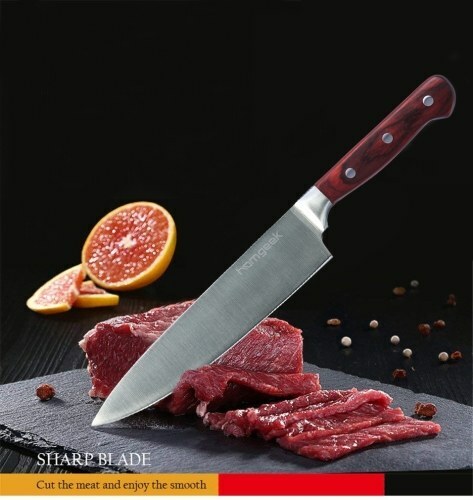 Knife Blade is made from X50Cr15 German high carbon stainless steel, Premium quality, stainless steel imported from German, for superior strength, toughness and rust resistant, application for kind of kitchen activity. 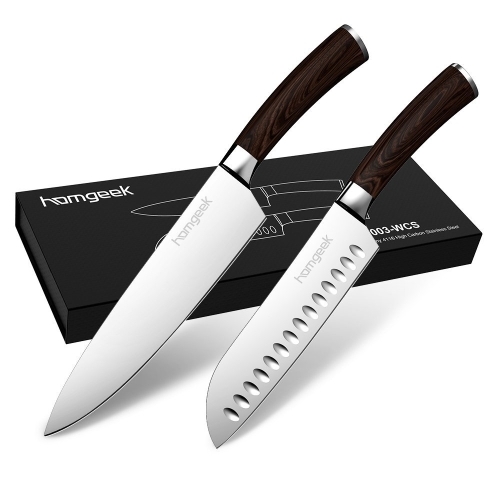 ✓ Each blade is a precision forged, made from German high carbon stainless steel at 55 Rockwell Hardness. ✓ Premium quality laminated pakka wood handles imported from Spain, for superior strength, refinement, and beauty. ✓ Mirror polished, finger protective bolster provides for a perfectly engineered balance with just the right heft. 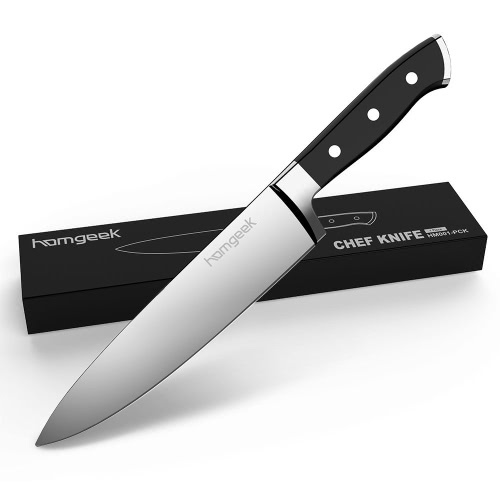 ✓ The edge is painstakingly hand sharpened to 16-18° per side, ultra sharp. 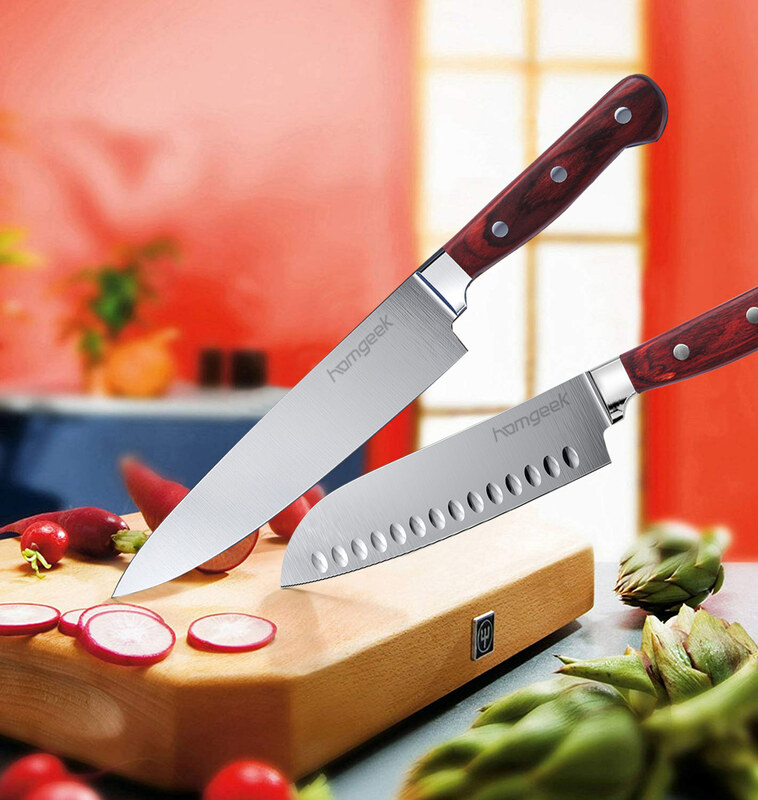 ✓ Full tang for incredible robustness & quality, triple-riveted for even more durability. 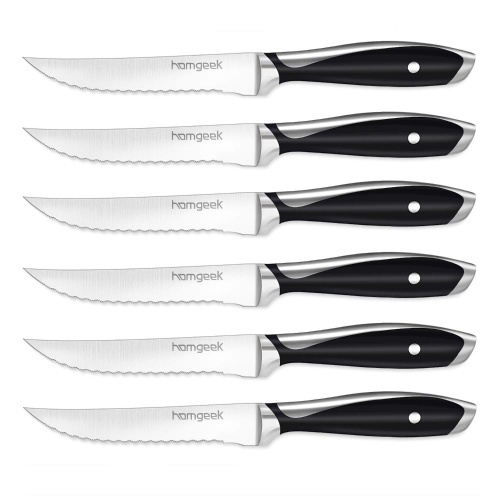 ✓ Tapered design for hardness and flexibility to assist with food preparation and chopping activity. ✓ Ergonomic handle shape for maximum comfort, grip, and maneuverability. ✓ Stain resistant, Cleans easily for low maintenance. ✓ Polished spine to facilitate a comfortable pinch grip. 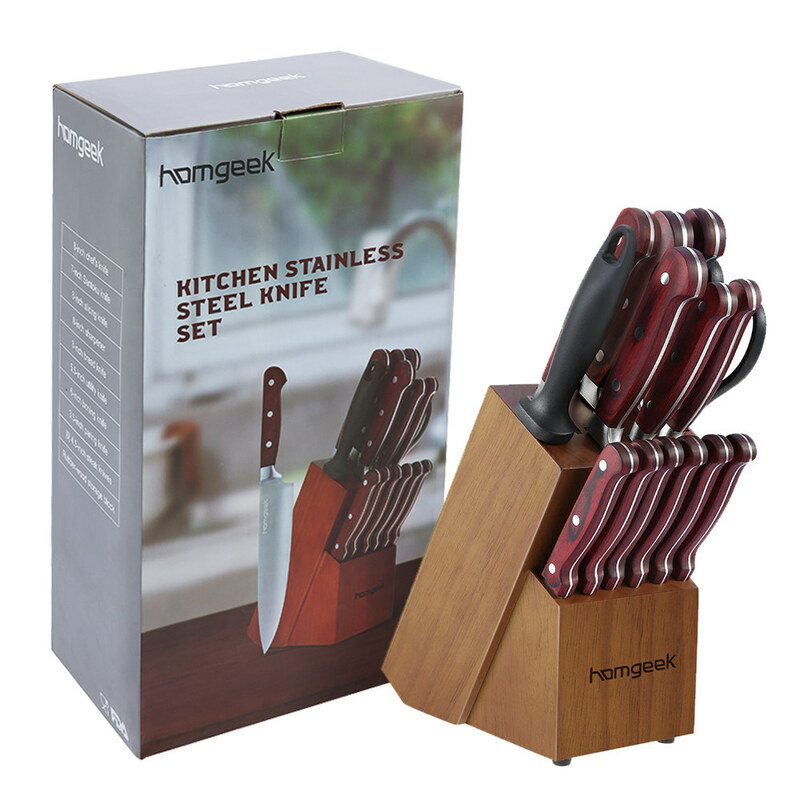 • Avoid using kitchen knives for other household tasks such as cutting twine or opening packages. Keep a pocket knife or scissors for that purpose, so as to avoid dulling the blades. 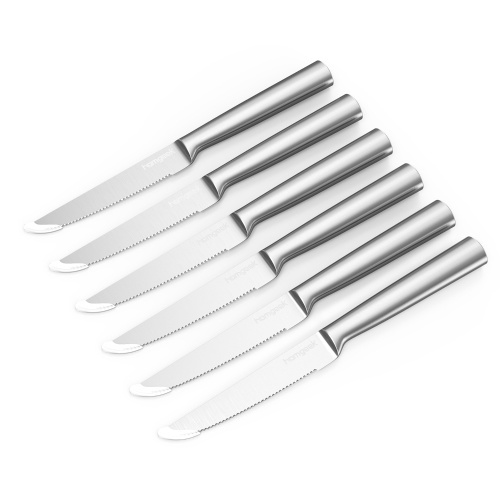 • Never wash your knives in a dishwasher as the powder cleaners can be abrasive and dull the knife as well as corrode the rivets in some cases. It can also break down wooden handles so they are more likely to become brittle. 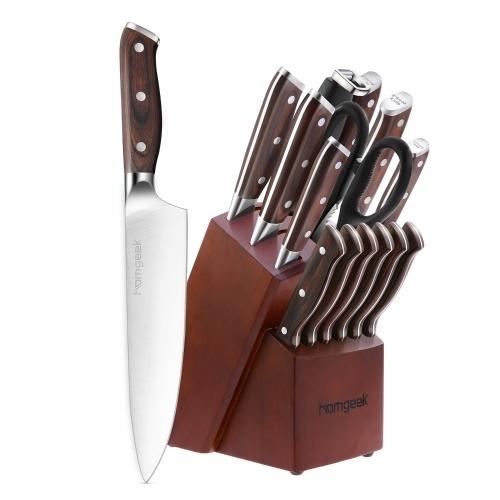 Always wash kitchen knives immediately after use, by hand, dry and put them back in the knife block. 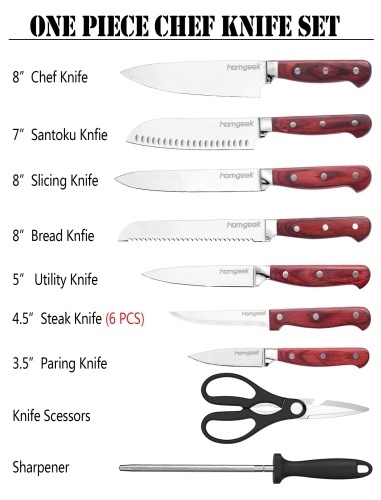 • Always handle knives with great care and pointed away from your body and the bodies of others in your vicinity. Never rush or run when holding a knife. 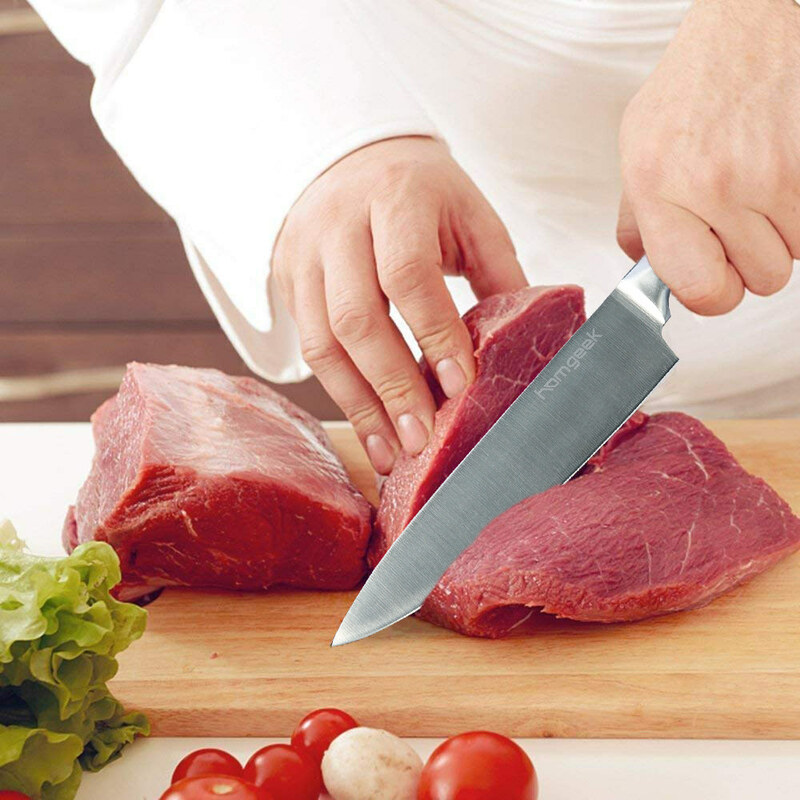 • 8" Chef Knife—A multifunctional knife with a curved blade. 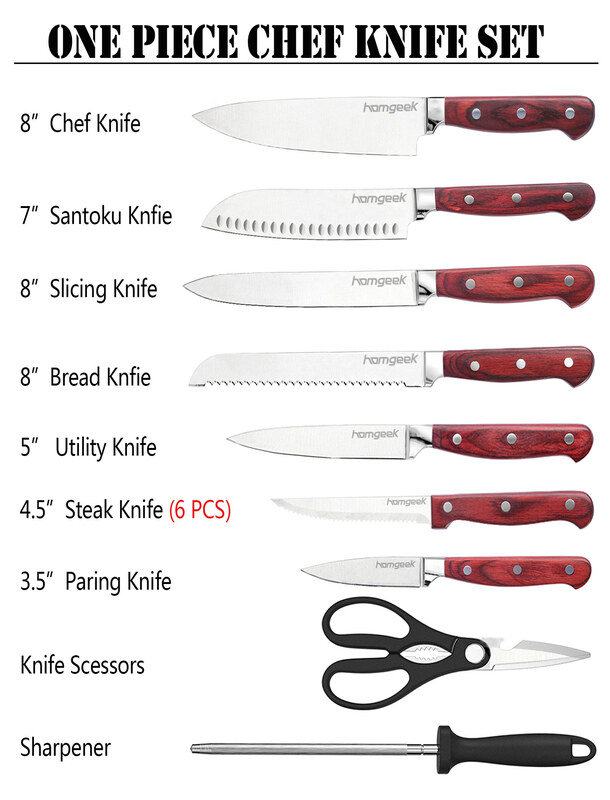 • 8" Bread Knife— Scalloped and serrated blade cuts bread. • 8" Slicing Knife—Cutting smaller and thinner slices of meat and fish. 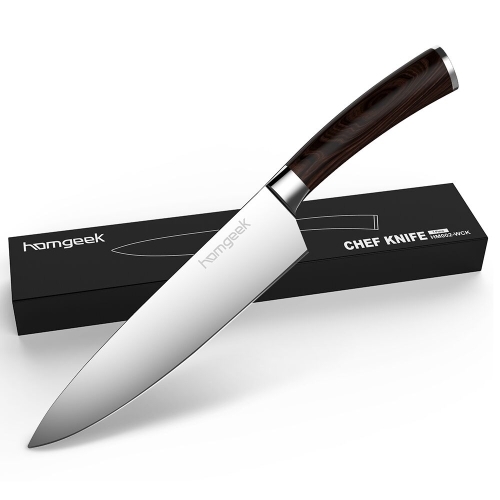 • 8" Sharpener—Keeping in excellent condition will enhance chef capabilities. 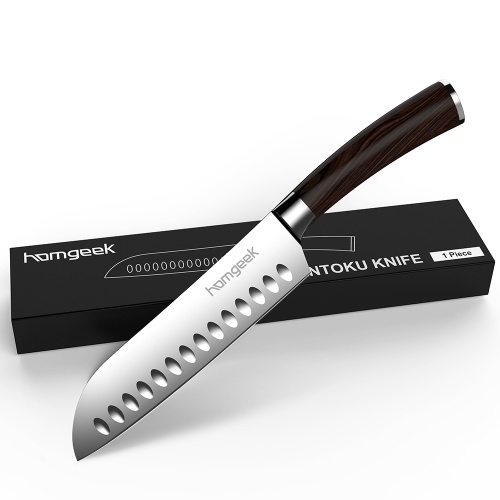 • 7" Santoku Knife—Slicing, dicing, and mincing. • 5.5" Scissors—Cleaning skin off of poultry and trimming fat meat. 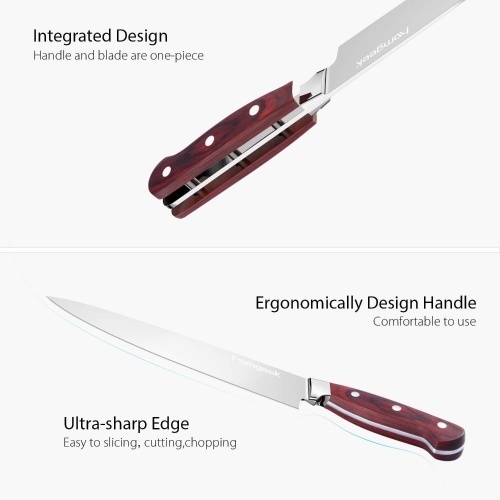 • 5" Utility Knife—Designed to cut fruits and vegetables and remove fat or sinew from meat. • 3.5" Paring Knife—Peeling, trimming and segmenting fruits and vegetables. • 4.5" Steak Knives(6 pcs)— Steak knife with Serrated that segmenting steak easy. 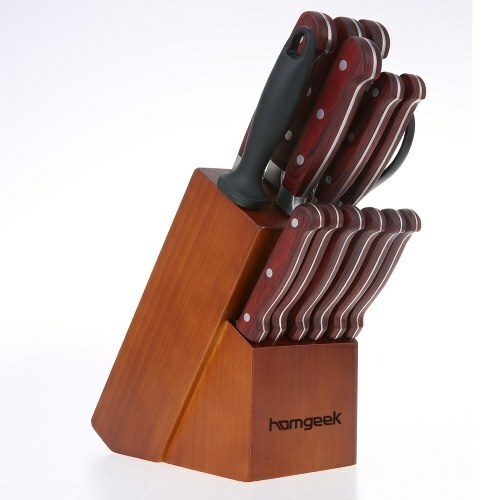 • Knife Block—Keeps your kitchen clean and orderly.